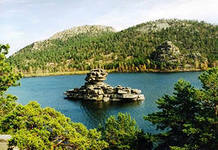 In the Northern Kazakhstan, between Astana and Kokchetav there is a wonderful region, real oasis – Borovoe. Geographically this place is named Kokchetav elevation, but the local guides call it “Kazakh Switzerland”. Forested hills occupy an area of about 30 kilometers. There is the endless Kazakh steppe around. Borovoe sounds almost equally both in Russian and Kazakh. Borovoe became a popular place, people began to come here from afar to get some treatment and drink bracing kumys. A man very frequently and thoroughly change nature and the danger to lose the natural landscapes, kinds of animals and plants appeared. The issue of saving the splendid nature of Borovoe and foundation of the resort began to be discussed by the scientists in 1910. The state reservoir Borovoe was established by the Resolution of National Central Executive Committee and Soviet of National Commissioners of USSR signed by Kalinin M.I in 1925. On the 15th of August 2000 Borovoe forest management was declared the State nature national park “Burabay”, the area of which was 120 ha. Many of plants and animals are included to the Red Book. The pride of the resort is rivers and lakes. There are few rivers; they are small rivers: Kalshykty, Syrybulak and others. They are all shallow. There are more than 30 lakes. The lake Borovoe is divided into two groups. At the foothills and in the forests, on the granite channel there are deep and large lakes with fresh water, they are Borovoe, Big Chebache, Small Chebache, Shchuchye, Kotyrkolskoe. Some shallow lakes in the mountains and forests refer to the same group. They are Gornoe, Lebyazh'ye and Svetloye. Some of these lakes are running, their bottom is rich in plants and waters in fish. And there is another appearance of the lakes in the steppe. The special microclimate of this land, its treatment air, which if full of resinous smell, peloids allow to consider Borovoe as one of the leading resorts in the world. It is no accident that in 1938 this land got the second name “Kazakh Switzerland”.